After spending close to 90 minutes and thereabouts, we were able to feel a gentle vibration in the air. We stretched our vision past the viaduct into the deep black tunnel, which I guess is tunnel no 41 UP, and could see an approaching light. The moment of truth and the reason why we came here. 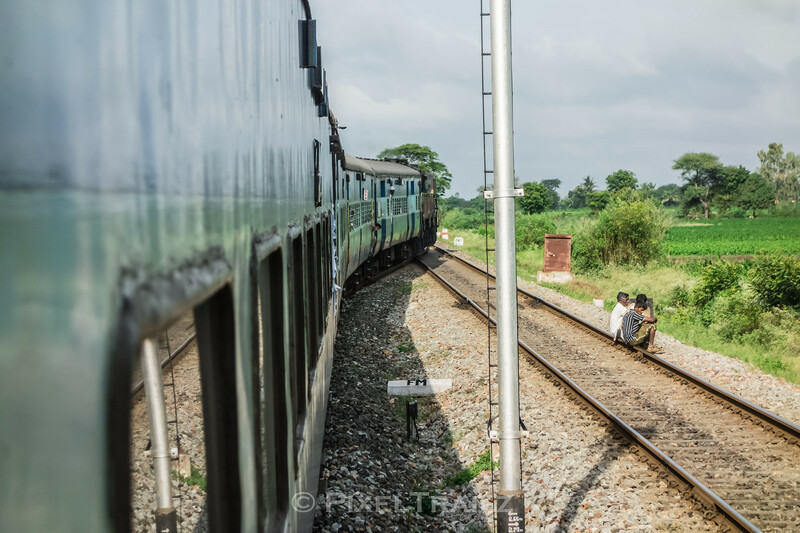 Our initial guess was just a pair of bankers going downhill after finishing its duty, but we were excited to witness 3 Kalyan WAG7’s acting as brakers with another idle G7 with a loaded BCNA going downhill. After a 4 minute display of cautious descent, we had the line clear to continue with the rest of the hike up to Monkey Hill. With an experience of walking through 3 or 4 tunnels, we started off towards Monkey Hill with a slightly more confident frame of mind. This of course is after snapping us in all possible angles and locations. Clear To Go . Brake Tested and clear to go as a Pune 3D peeps out. 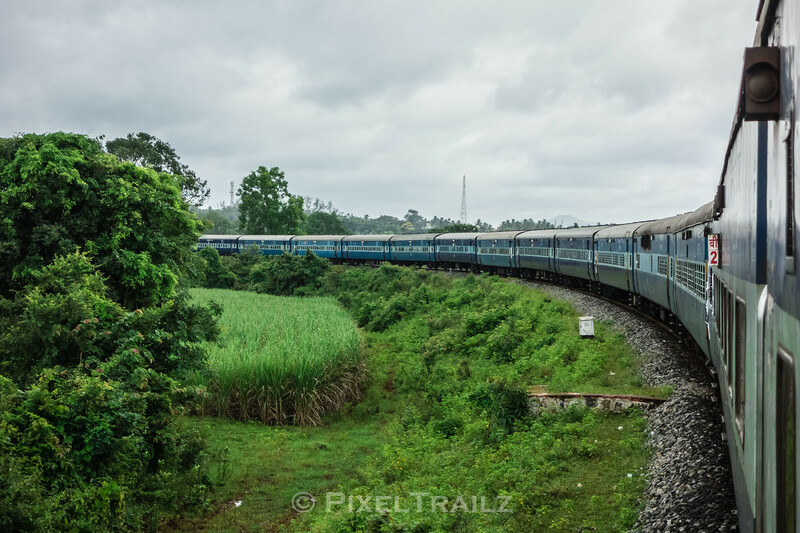 CSTM-Nagercoil Exp rushes past Monkey Hill. 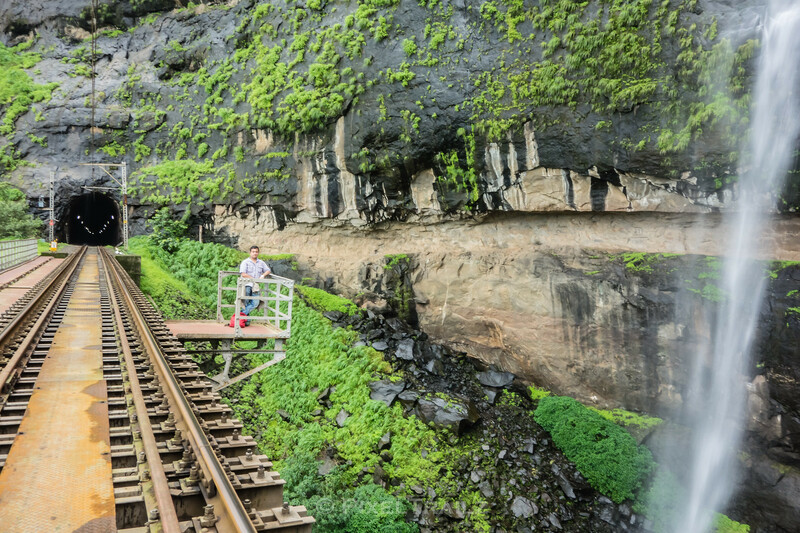 Monkey Business – Rail Action at Monkey Hill. Technical part of me is not very sure, but my guess is this last tunnel towards Monkey hill was also close to around 700-900 meters long. So here we go chugging along after an unforgettable couple of hours. I have to mention here that at every possible opportunity, our generous IRFCAn was in touch with us and inquiring if we needed any assistance or help. We have been in touch for close to 4 hrs now playing a cat and mouse game and by now, we were pretty confident that we would not be able to meet this gentleman. Moving on, as we crossed around 25% of the tunnel, suddenly the tunnel went completely dark. All the lights inside the tunnel decided to take a break. We switched off our flashlights for an instant. Well, THAT WAS DARK, absolutely dark. I couldn’t even see my hands as I slowly stretched them and kept it inching it towards my eyes. The only reason I did not manage to pop my eye out was my awareness in the space and time dimension and not succumbing to spatial disorientation. Flashlights came back on quickly and our sprint towards Monkey hill continued. BTPN Rakes hiding in plain sight as it descends the Ghats. Halfway down the tunnel, we could see an unmistakable triangular pattern of lights of a locomotive pulling something towards us. There was enough time for us to look out for the next refugee point and waited for the train to cross. It appeared to be some sort of a maintenance or a departmental rake. The subsequent walk towards Monkey Hill was brisk and uneventful. Just as we were about to pass the catch siding and have a look at the other two lines, the down mainline signal turned green. 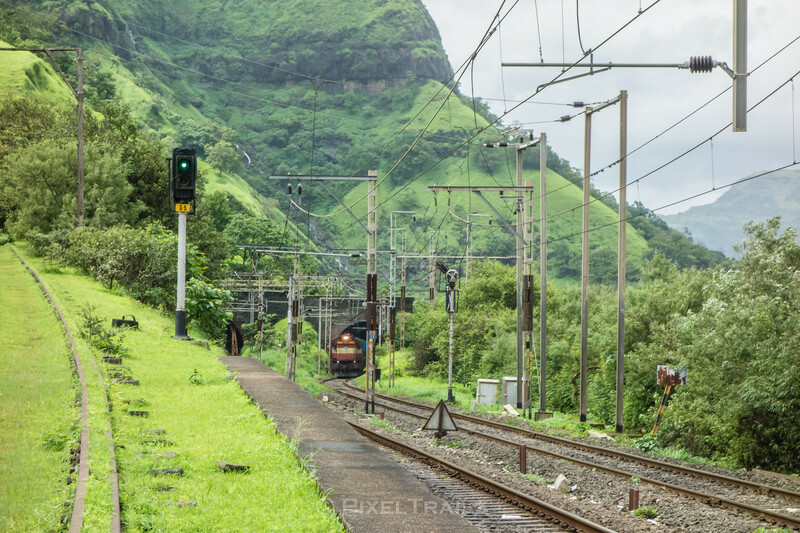 A quick sprint and a gentle climb towards the catch siding, Balaji express bound to Nagercoil, with a Pune 3D, headlights on, quickly rushed past towards Khandala. 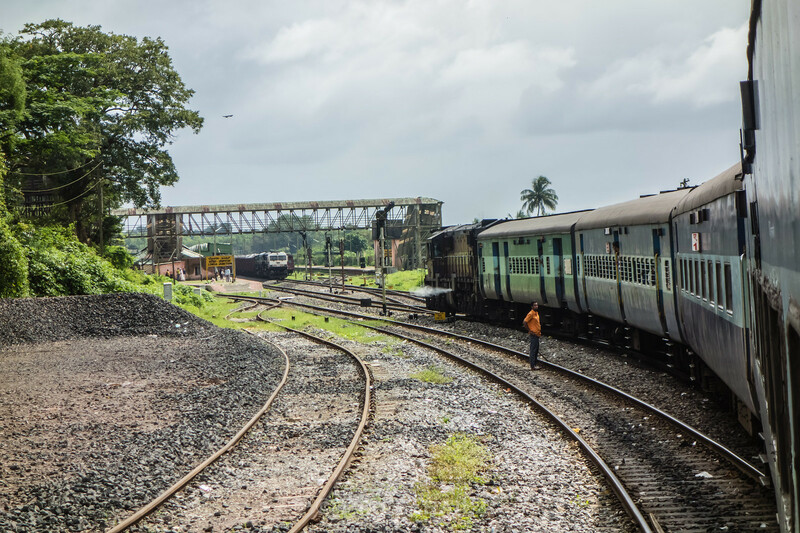 The mid line starter was also green and a KYN WAG-5A with a BTPN rake continued its journey towards Karjat after its mandatory brake testing halt at Monkey Hill. The lonely Guard spends some quality time with himself. Monkey Hill Awaiting its next visitor. 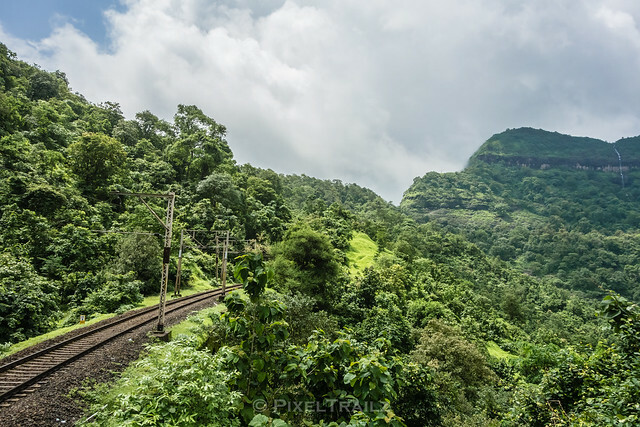 After a refreshing 4 hour hike in the Sahyadris, we decided to rest a while before we could take the Sinhagad express towards Pune for the second leg of our monsoon rail trip and this was a bad decision. 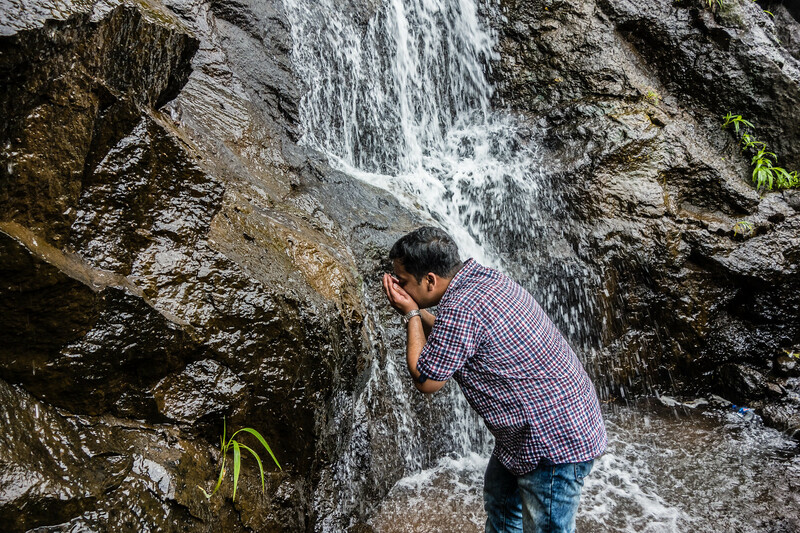 Until now, the adrenaline, the refreshing greenery and the excitement of spending quality time with nature far from the madding crowd had kept our energy levels and enthusiasm sky high. If anyone could recall, my friend had not slept in the past 24 hours and I have been up since 2 AM in the morning. A relaxing 5 minute nap at Monkey Hill was so tempting that we succumbed to it. All our adrenaline took a back seat now and tiredness and drowsiness took center stage. The 5 minute break did more damage than good and we had to drag ourselves back to continue with our hike. We called up our IRFCAn and figured out that he would be banking the Karjat-Pune Shuttle and would be his final trip of the day. Since the shuttle would not stop at Monkey Hill, with a sense of missing something we thanked him for all his help and decided to wait for Sinhagad. We were carrying sweets to gift people whom we may meet en route our travel and since we will not be able to meet our IRFCAn, we decided to indulge a bit and helped ourselves to a couple of famed Dharwad Pedas. Once energized, it dawned upon us that the shuttle would stop at Thakurwadi and we still had time to make it to Thakurwadi. With the help of a few railway workers, we managed to reach Thakurwadi just in time as the Pune bound shuttle was almost arriving. 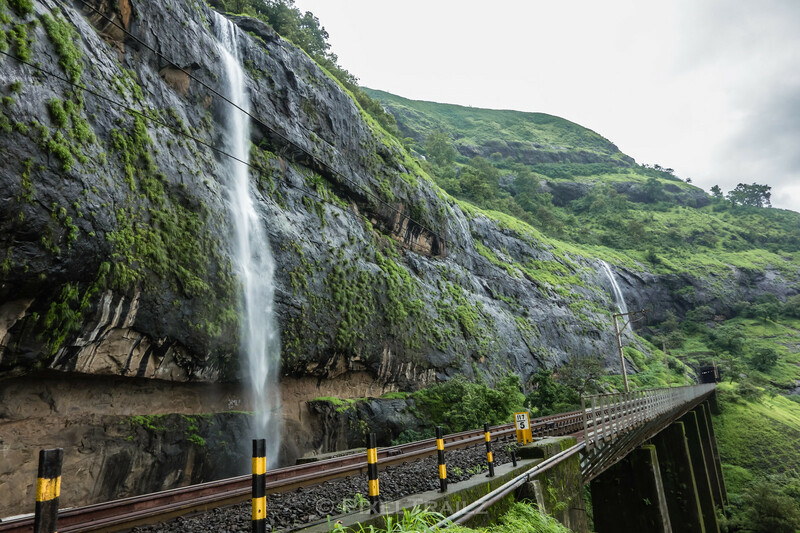 We were only able to make it the penultimate coach before the shuttle started towards Khandala. Quickly boarded and called up our savior of the day to let him know we were in the shuttle he was banking and that we would meet him at Khandala. 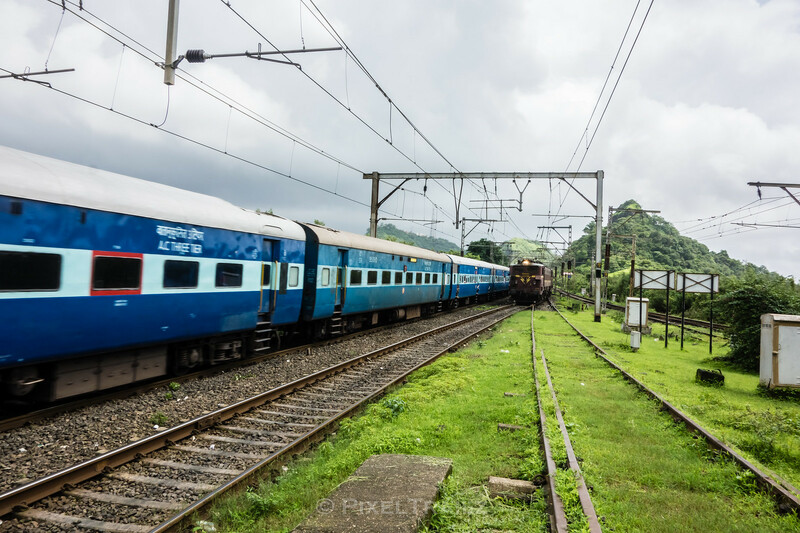 Soon enough Khandala arrived, a quick meet and handshake and we also decided to deboard at Lonavla as he would finish his banking duties to spend at least a few moments thanking him for his help before moving on. We had a surprise in store for us as we came face to face with Ashish Kuvelkar of IRFCA, Pune. 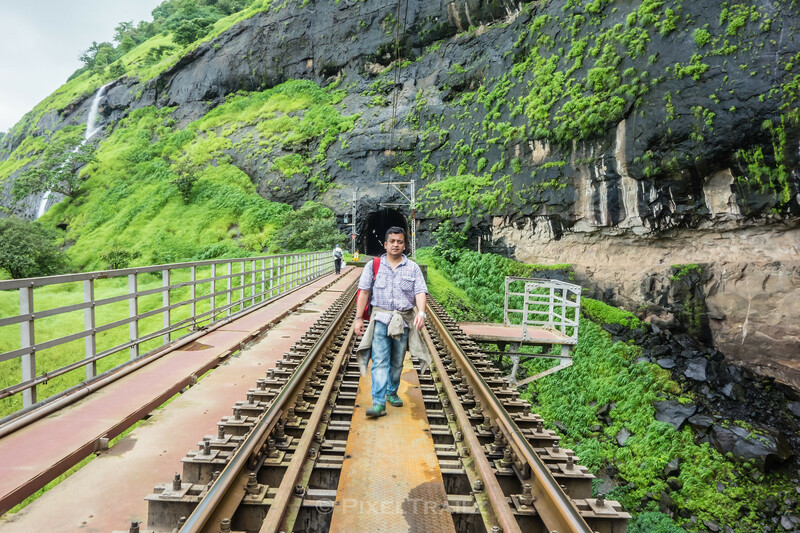 I was aware of the famed Bhore Ghat Picture of Coimbatore – LTT, popularly known as Kurla express shot at the very same location where we spent close to 2 hours today, but was ignorant of the fact that this shot was indeed clicked by him. Apparently he was there earlier today trying to capture our HYB – CSTM express as well :). As we parted, we gifted our generous guide and well wisher, the famed Dharwad Pedas, albeit with a couple of missing pieces and with due apologies for the same. I am the BOSS – This signal turns green only after the train stops for a specific period of time. Soon enough, Chennai bound 11041 pulled into Lonavla and after a quick check with the TTE, boarded one of the sleeper classes and in no time, drifted off to dreamland. Somewhere down the line we overtook the Karjat – Pune shuttle and pulled into Pune shortly before 6PM. We literally dragged ourselves out of the station and to the same nondescript hotel where we made a flying visit earlier in the day. I called up our original guide and well wisher for this trip and updated the day’s happenings and shared a few pics which I had taken with my mobile. It was then that we decided to make it to the IRFCA convention without fail at Bikaner in January 2016 as we were unable to meet with him and a few others as they were all held up with personal commitments. An hour of rest, followed by some tea, snacks and a quick bath and the planning for the next part of our trip started. 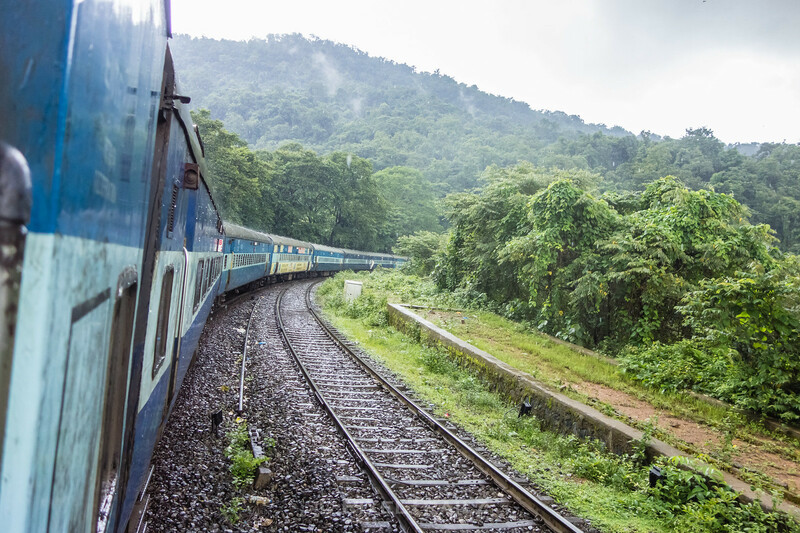 We had an onward journey sleeper class ticket to Goa (Madgaon) in 11097, Pune – Ernakulam poorna express. As much as we would have loved to take the sleeper, physical exhaustion and lack of sleep took a toll on us and we decided to travel by 3A. Tatkal showed an availability of around 10 berths and general waiting list of 3. With charting due in the next 10 minutes, we immediately booked 2 3A tickets to Madgaon and cancelled our sleeper class. As expected, we got confirmed berths on chart preparation and decided to doze off for another hour before venturing out for dinner. 8PM, we check out and drag us and our luggage again to Pune. Thankfully enough we were spared a climb as Poorna was berthed on PF1 of Pune station. A quick dinner, couple of bottles of water and something packed for later in case of eventuality, we quickly settled onto our berths for an extended rest before we reach GOA the following afternoon. After a terrific and tiring day, we drifted off with a satisfied soul and a tired body. Early morning freshening up and rituals needs to be completed before the world around you gets up and I am usually a very early riser especially while traveling. The early morning freshness and the rhythm of the train speeding past vast fields of nothingness preps you up for the day. However the day started late for me considering the previous day’s adventures. 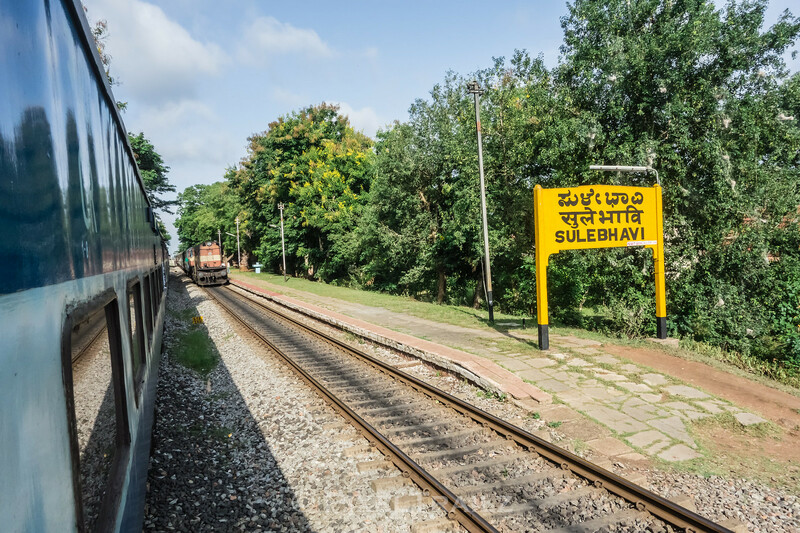 By the time, I could freshen up and set myself up, we were crossing Sulebhavi and probably the Belgaum – Miraj passenger and shortly afterwards entered Belgaum. As is the fashion nowadays, Belgaum is now renamed to Belagavi. A long wait for the SWR Queen ensured that we have a good breakfast and some station tea. Rani Chennamma arrived with UBL WDP4 20026 in LHF and soon enough we were given the starter to proceed towards Londa. Londa, usually a laid back and relaxed station was a beehive of activity. 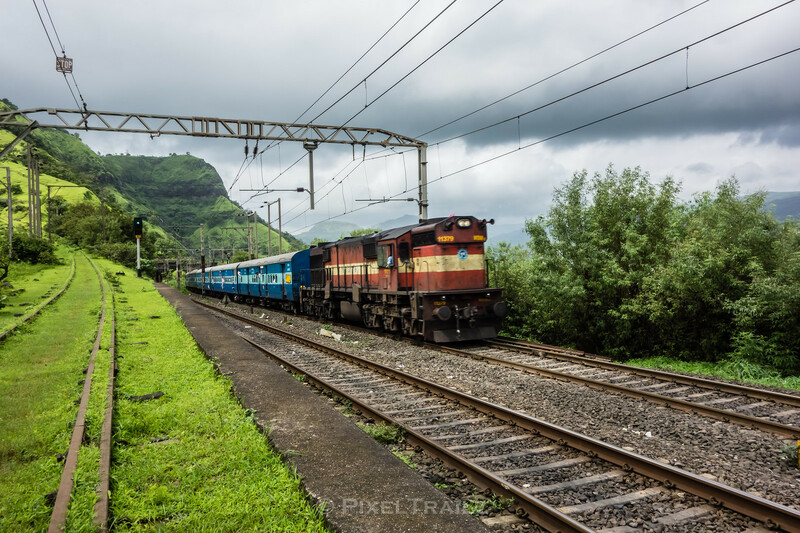 Poorna has a loco reversal at Londa to move towards Castlerock and Dudhsagar. As we entered Londa a good one hour late, we had on an average of 3-4 RPF boarding every compartment and settled down near the doors. A big setback to doorplating, which we will overcome in due course. 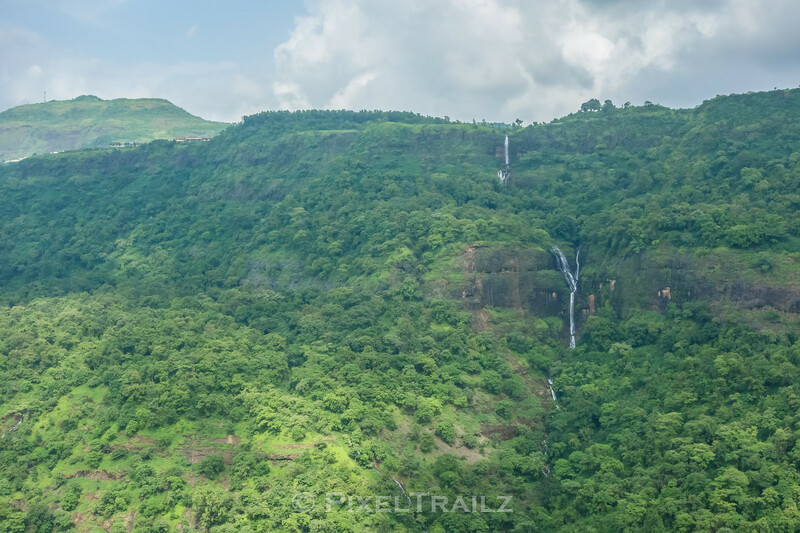 Ever since Chennai Express decided to take a diversion to go towards Komban village, Dudhsagar, once a pure railfan’s delight and private spot, soon became a tourist spot with fly by night operators starting trekking and hiking services to Dudhsagar, which if I am not wrong is the 5th tallest falls in India. Needless to say the place had become filth galore with plastics and beer bottles and all sorts of items intended for very private & intimate use. Imagine this. 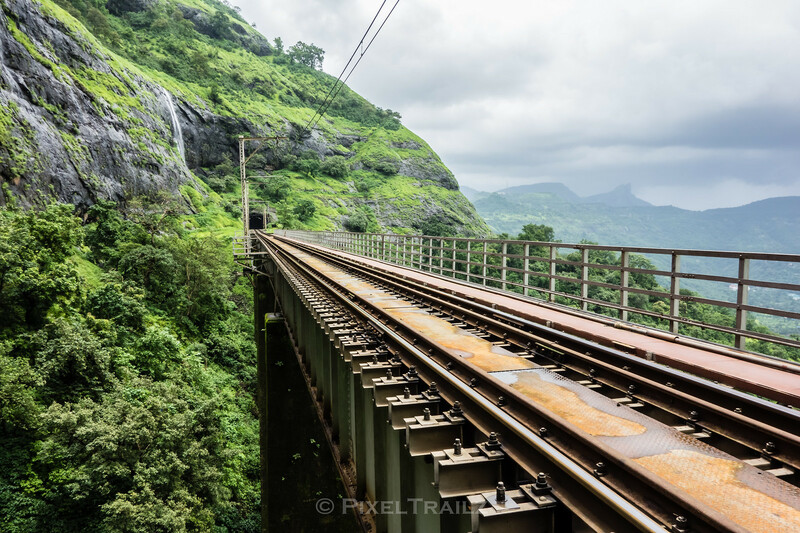 A viaduct over which the train passes at an extremely relaxed speed, just enough space for another 2-3 folks on the left standing shoulder to shoulder, no space on the right, the majestic Dudhsagar waterfalls on the left and a deep valley down below taking the Mandovi river all the way to Goa. Now imagine close to 3000 folks in that narrow space fighting each other for a safe space when the train passes. 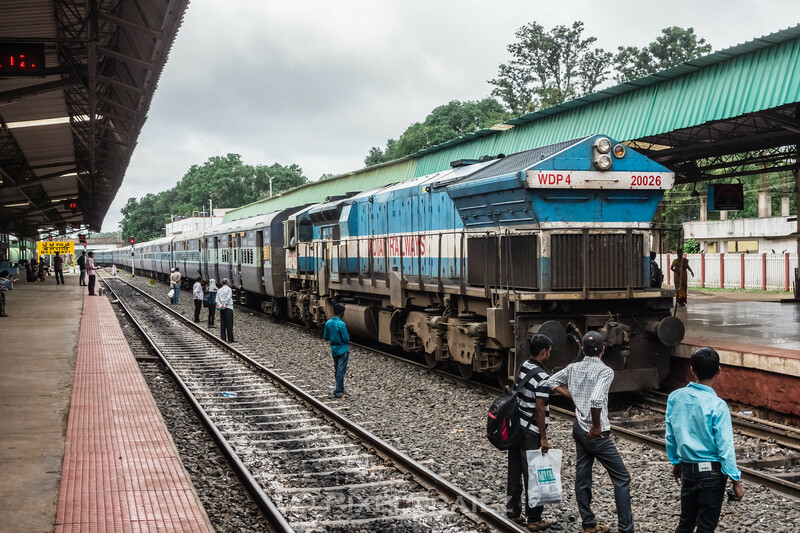 A nightmare for the loco pilots and they have been raising this concern for way too long ever since Rohith Shetty decided to mess up with his movie for those who keep their brains at home. It had to happen and eventually it did, multiple accidents, life threatening injuries, a few fatalities of being run over by trains and to top it all our illiterate and the “educated” joined hands and broke the glasses and injured the passengers of the Nizamuddin bound Super (Goa Express as it is called). All such hooliganism and stupidity needs to pay and the yes the public paid. Dudhsagar was made completely out of bounds and the South Western Railway clearly indicated that it would press criminal charges against anyone found trespassing railway property and to ensure that this happens all the RPF Circus started off in Londa. An Empty Dudhsagar on a Sunday !!! After a good 30 minute wait, the loco reversed and we started moving off towards Castle Rock. There is only one way, I could now doorplate up to Kulem and decided to get on with it. We started talking to the RPF guards on duty near the doors and asked them as if we knew nothing. We wanted to get off at Dudhsagar, but the last minute developments at Dudhsagar forced us to change our plan and go all the way to Goa. Well the RPF don’t know that. We expressed our disappointment on not being able to get off at Dudhsagar, even though it was not our plan and started empathizing with them (Which was Genuine by the way). Soon enough the talks become better and we managed to convince him to move off the doors so that we can atleast enjoy and click pictures and shoot some videos. In the meanwhile a very senior RPF officer boarded our coach and we came to actually realize the problems RPF face within our country. After an extended talk with him, he ended up showing us the videos of how GOA express was vandalized by the brainless tourists and how they were forced to do what they had to do. In the meanwhile, we reached Castle Rock, added a couple of brakers and moved on. 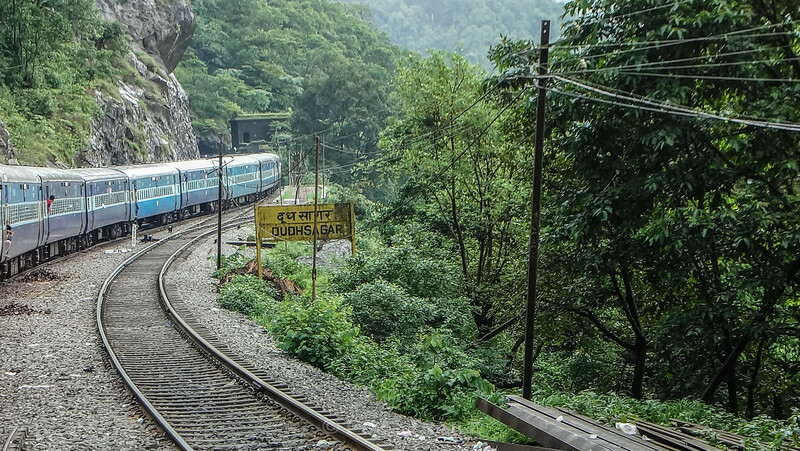 As we neared Dudhsagar, he suggested us one way where we could actually manage to walk down to DDS with no fear of RPF or any other trespassing related issues. Dudhsagar arrived and an army of RPF deboarded along with another army which was already present there. They ensured not a single passenger deboarded the train at DDS. 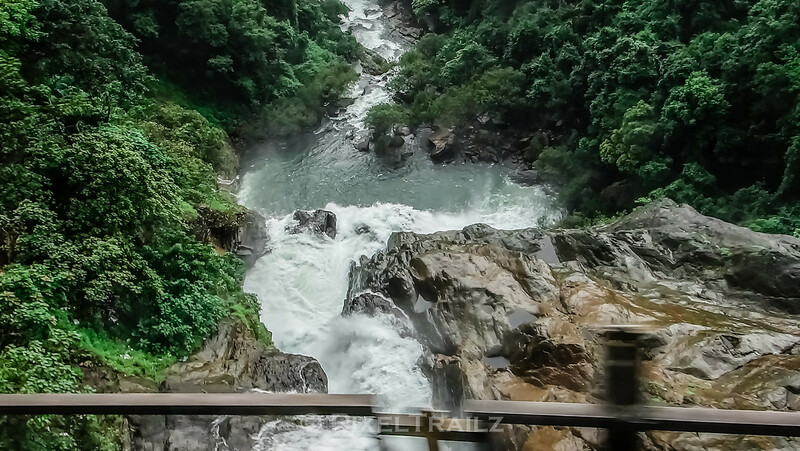 After the brake testing halt, we moved forward and as we crossed the tunnel, the sound of gushing water and misty water sprays rekindled the spirit of adventure and that we should make it again here one way or the other. As always DDS is a majestic sight and this time it was no exception. 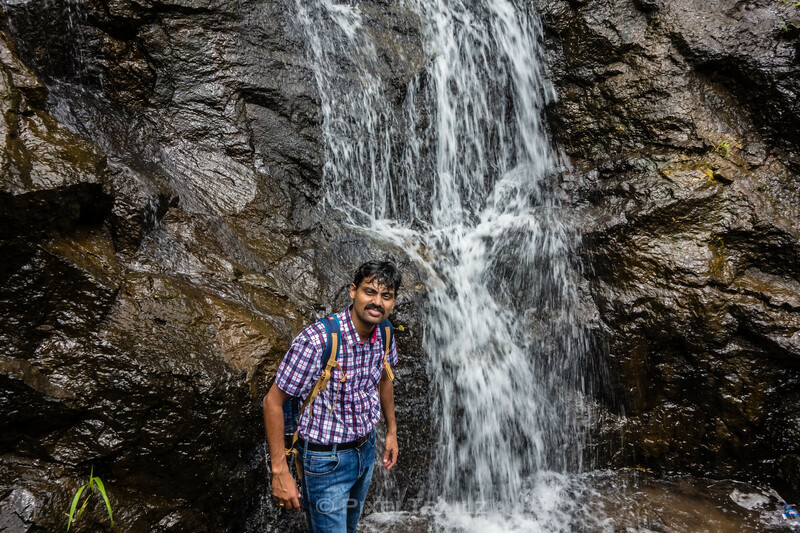 In spite of below average monsoon, Dudhsagar waterfall is always a breathtaking sight. One good outcome of this ban fiasco was that Dudhsagar had regained its lost glory and the place was as green and clean as possible. With no plastics , beer bottles and other stuff around, I felt good for the place and the ban seemed justified. After all what do such over the top vandals like us deserve. 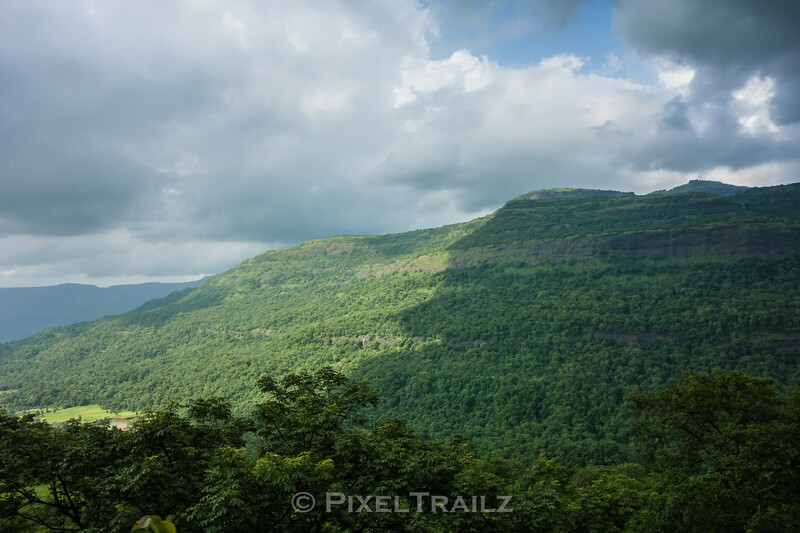 We will miss the beautiful monsoon trek and solitude this place has to offer. 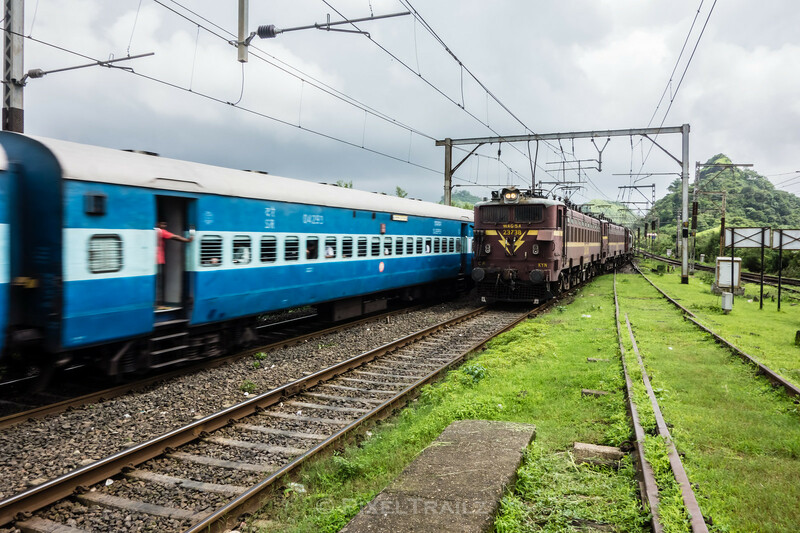 We had a technical halt again at Sonalium where a few disappointed trekkers boarded the train and rest of the run up to Madgaon was uneventful. Post Kulem poorna managed some breathing space and went on a rampage. Soon we joined the Konkan line from Mangalore and entered Madgaon a good one hour behind schedule. 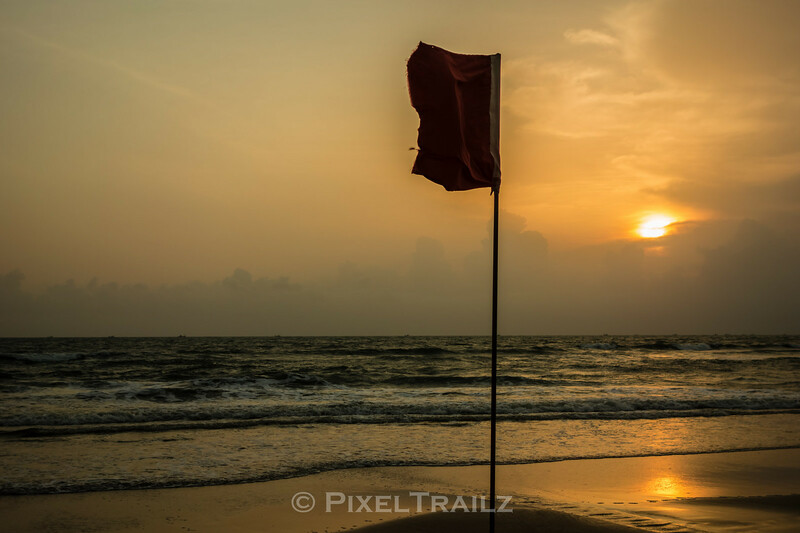 There is something about Goa beyond the beaches and partying spirit which I am unable to express in words. A feeling you have to experience it to appreciate it especially during monsoons. We take a pre-paid cab and move into our hotel near Colva beach where a spirited game of football was going on in full flow. 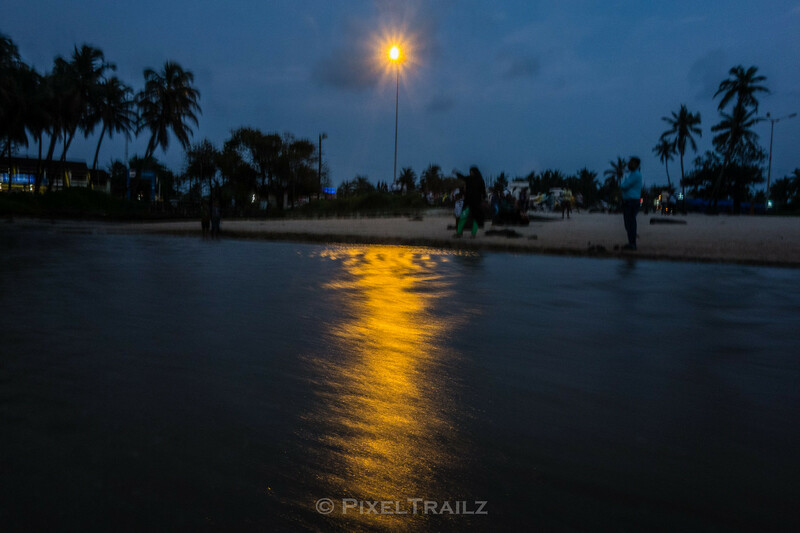 After witnessing it for a few minutes, we order some food and freshen up and take a walk towards the beach. After enjoying the next football match for a few moments with a cup of roadside tea, went to the beach to click some snaps of the setting sun against the Arabian sea. However nature had other plans for us presenting us with a very cloudy sunset. 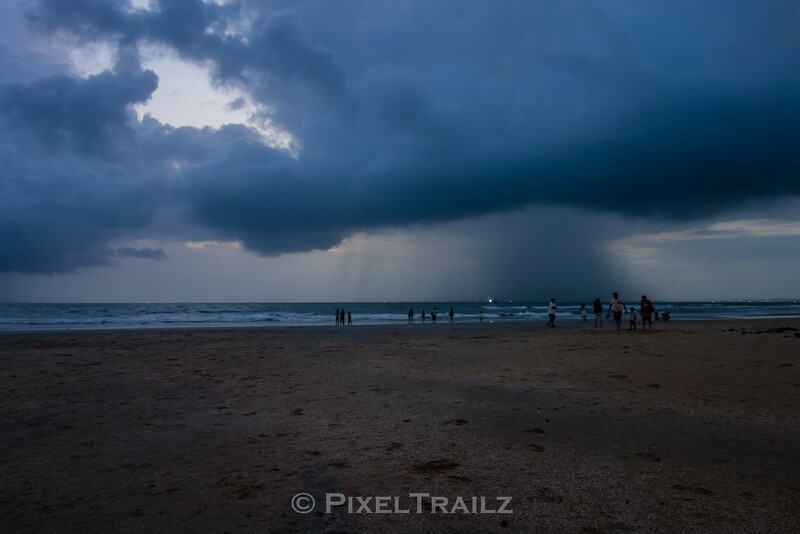 While we were contemplating how to blend in with the Goan spirit the heavens opened up with absolutely zero warning in all glory. Add to that very strong winds and before we could hunt for our umbrellas or jackets, we found no need for the same. Shoes in hand with a heavy breeze and unprecedented downpour, we went walking barefoot towards our hotel for some dinner and enjoy the Goan spirit. We have another full day to explore and the plan initially was to visit the Sharavati Bridge at Honnavar and be back later in the day. However we had no idea on how things would change in the next couple of hours. Stay tuned. I have to admit that we were not very comfortable in walking back towards Monkey Hill. 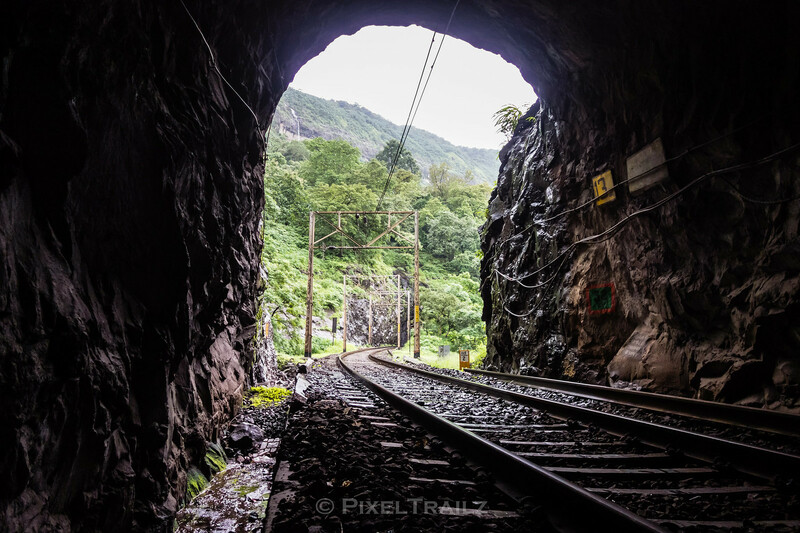 Remote location with no local guide or support, slippery tracks, spurts or heavy rainfall, dark long tunnels and trains rushing towards you at 50kmph downhill were still haunting us. We decided to have a talk with the gang men who were working over there to get a perspective of what is in store for us. I do not think it was a common everyday sight for them to see folks alighting at brake testing points and their bewilderment gave way to curiosity as we approached them. The bright orange shirts made a start contrast with the then bright blue sky and fresh green surroundings. Without second thoughts we inquired with them and questioned them on the safety of walking towards Monkey Hill across the tunnels and the viaducts. I don’t know if it was my Hindi or my appearance, I think they figured that we were lost and came up with a couple of options. 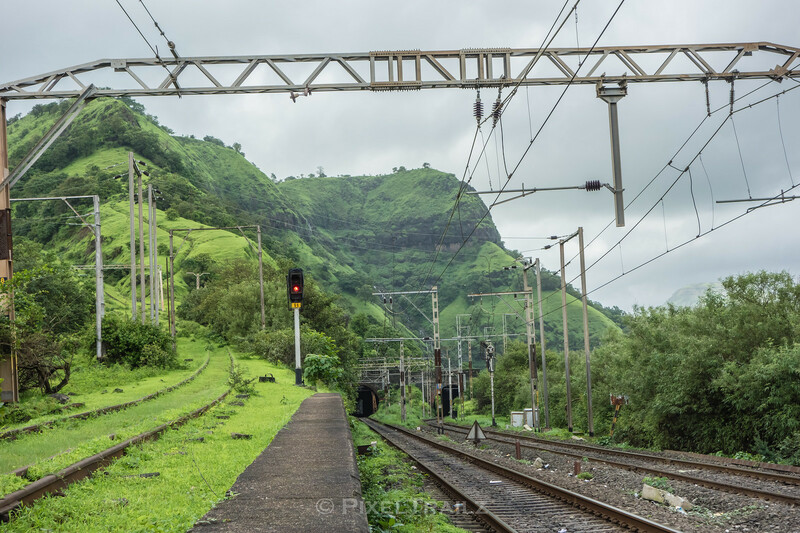 The first one, continue onto the path towards Karjat and ascend the catch siding. 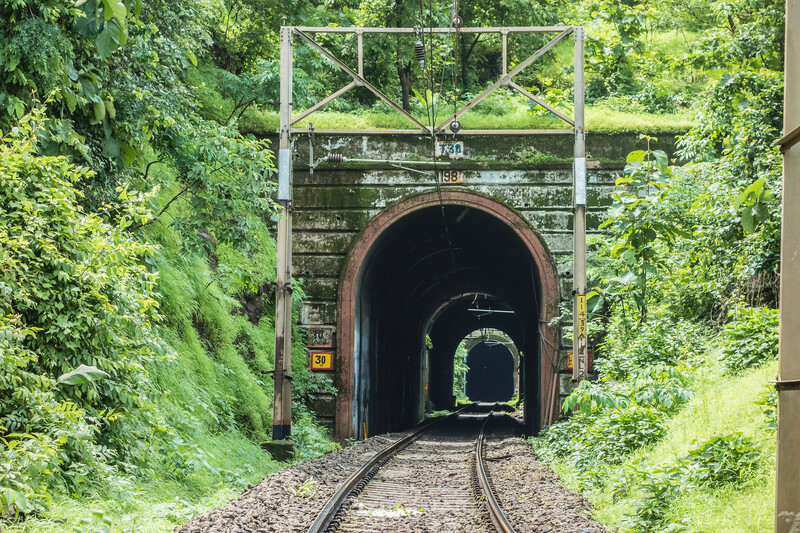 Towards the end of the siding, there is a tunnel which would take us towards Thakurwadi where the traffic would be better and we can take an UP (Downhill) train towards Karjat. 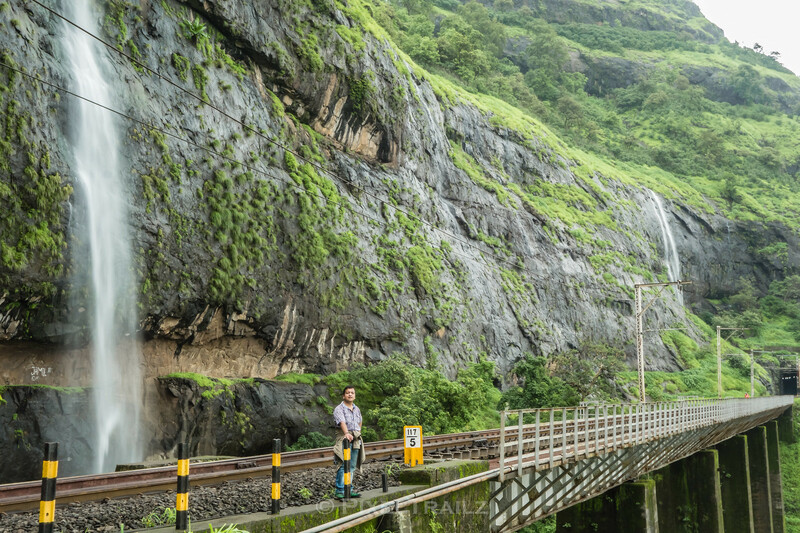 An alternate approach would be wait there until we get a banker or a passenger train towards Karjat. Bankers normally transport these ghat section workers between different points and apparently if we could request the LP’s politely and nicely they may help us up to Karjat. While these options seemed to be the easy way out, we ended up explaining them the purpose of our visit and wanted to evaluate the risks before entering the tunnels and viaducts. Now that we had made our intentions clear, the gang men ended up being our savior. They spent about five minutes explaining the nuances and signs to watch out for in while in the tunnels. 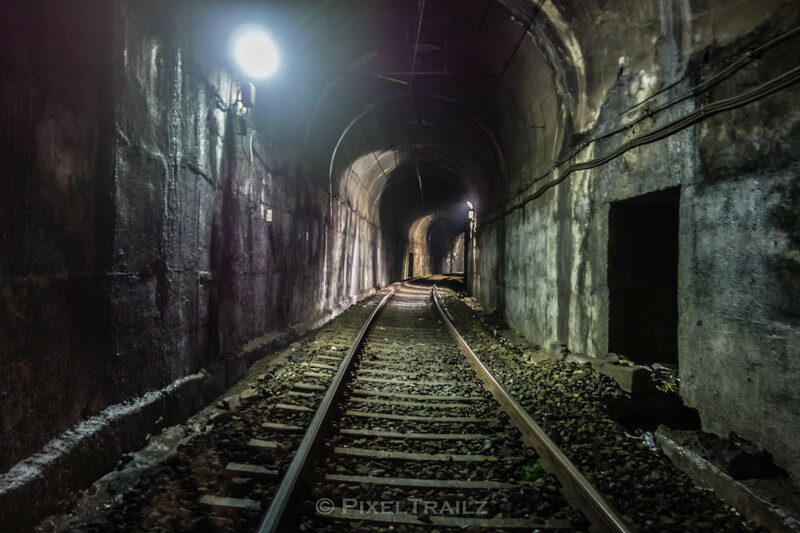 1.Do not enter the tunnels if you do not have a fully charged flashlight which would last the distance. 2.Walk along the outer edge of the curve if there is any. 3.Do not talk or chit chat. Focus on your path and keep your ears open for any sounds. 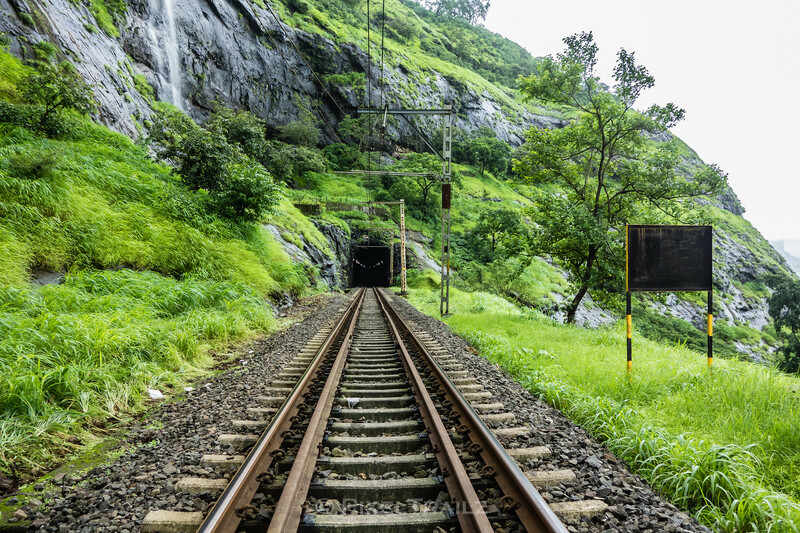 The sound of a train approaching cannot be mistaken, but you need to keep your mind free from distractions. 4.Stay away from the tracks if there is fog or mist. 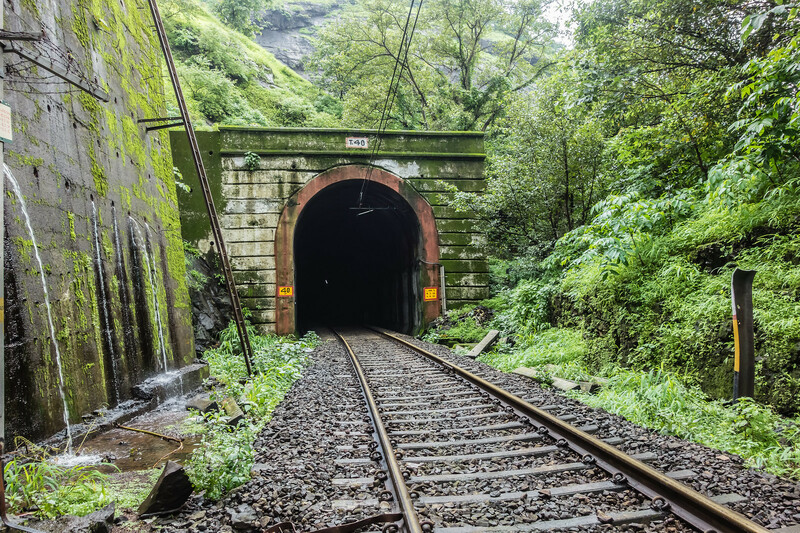 5.An approaching train usually displaces a lot of air when it enters any tunnel and the gush of wind is an unmistakable sign of an approaching train. 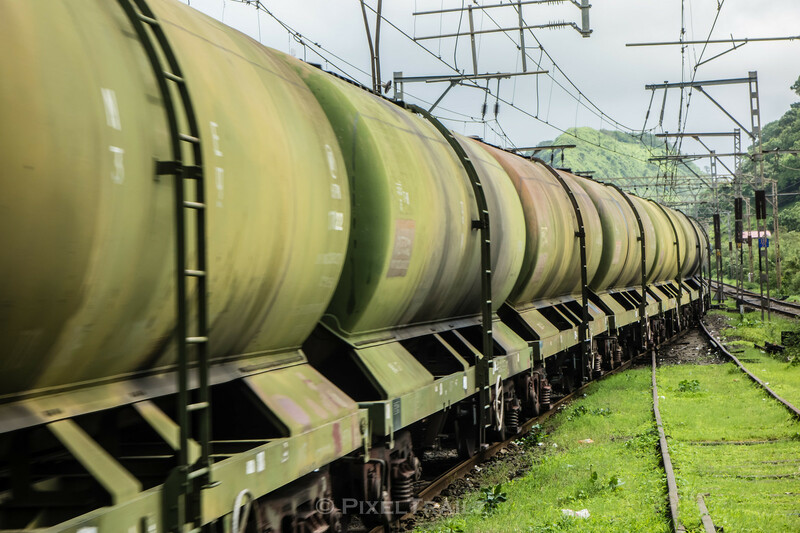 Get into a relief point nearby if you could spot the train and assess the distance. If not, just get down the ballast, lay down your backpack and lay low until the train passes. A wet and soiled jeans is a much better alternative than having a face to face encounter with the trains. They also assured us that there is enough space between the tracks and the tunnel walls, but it is always better to have options. 7.In rains, avoid standing right below the OHE and especially so if you have an umbrella. 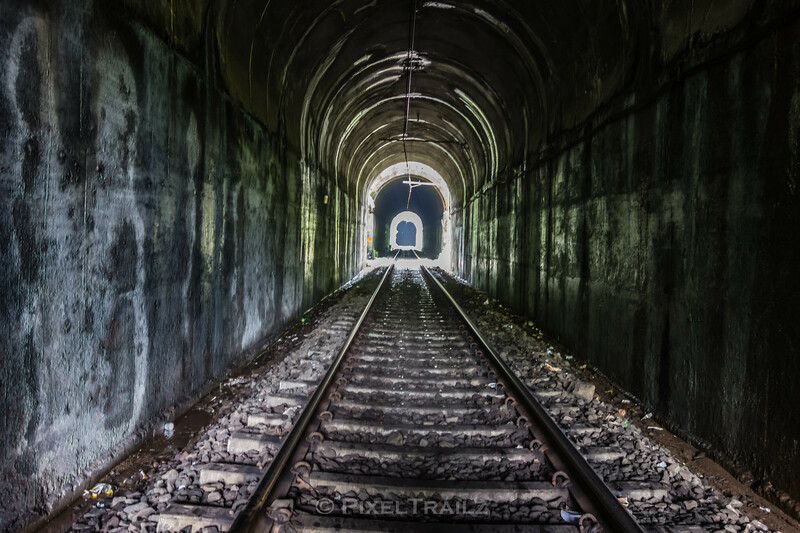 8.Walk on the tracks inside the tunnel and whenever possible stay out of it. 9.Last and the most helpful advice. We do it everyday. It is safe if you focus your mind. Nothing to be bothered about. Stay sharp and focused. Do not left your mind drift and you will be fine. This five minute chit chat with the gang men really boosted our confidence. We freshened up a bit and started our hike towards Monkey hill. In spite of all assurances, as we looked at the first tunnel, our heart skipped a beat and we cautiously entered the dark side and then clouds started opening up a bit. While the tunnels did look scary and claustrophobic from with the train, walking inside one gave us a much clearer picture. There were clearances on either side for us to step down in case of an approaching train. There were interspersed refuge points to take refuge and were marked with a clear “R”. I am not sure about other tunnels, but at least in this section, it would be fair to say that these refuge points would be around 50 meters apart alternating on either side of the tunnels. We exited the first tunnel and halfway into the second one, we sensed a remote vibration and soft grumble very different to the eerie silence inside the tunnels and chirping birds and monkeys outside them. As we were right next to an “R” point and the fact that I needed to get my jacket off inside the tunnels, we stepped aside into the refuge point. The vibrations intensified and the soft grumble gave way to high pitched whines & screeches and burning smell of brake shoes rubbing against the steel wheels. After almost close to two minutes with headlights on 2 KYN WAG7 brakers with an inactive loco glided past us at a relaxed speed. I think the sound inside the tunnels gets amplified a million times as the brakers started applying the brakes to halt the 50+ BCNA rake at its first brake testing point. Just as I was about to click a pic, something stopped me from doing it. I did not want to attract any unwanted attention inside a tunnel. It took close to 4 minutes for the train to pass us and since the line was clear, we picked up pace and cleared the next couple of tunnels with little or no fuss. We crossed Tunnel 39 UP and came face to face with Tunnel 40 UP. Tunnel 40 UP is close to 900 meters long and the spot which we came looking for specifically is right after this tunnel. The excitement of being so close is palpable, but you still need to cross that long tunnel carefully and with no incident. We quench our thirst from those innumerable small waterfalls and in the process my partner managed to get his brand new flashlight dropped and it is now glistening brightly and casting its led glow all around the water below a small pit as a stream of water was gushing past. We contemplated getting down into the stream, which must be about 5 feet deep and retrieving the flashlight, but slippery moss laden surface and better sense prevailed as we decide to let it go. We had 2 more as spares anyway. We did not intend to wait and test the 30 minute water resistance theory as well and moved on. Tunnel 40 is on a curve and heeding the gang men’s advice we stuck on to the outer curve and kept a continuous watch of refuge points. The curve ended and we could see the end of the tunnel and the next tunnel in line. Now that we have a clear view of any incoming train, we dropped our guard ever so slightly and picked up our pace. In spite of our brisk space, the bright light at the end of the tunnel did not seem to increase in its circumference and after a grueling ten minutes, the heavens and the tunnel opened up right in front of us and presented us with the most amazing scene. …And.. I Was There !!! IT WAS UNREAL. 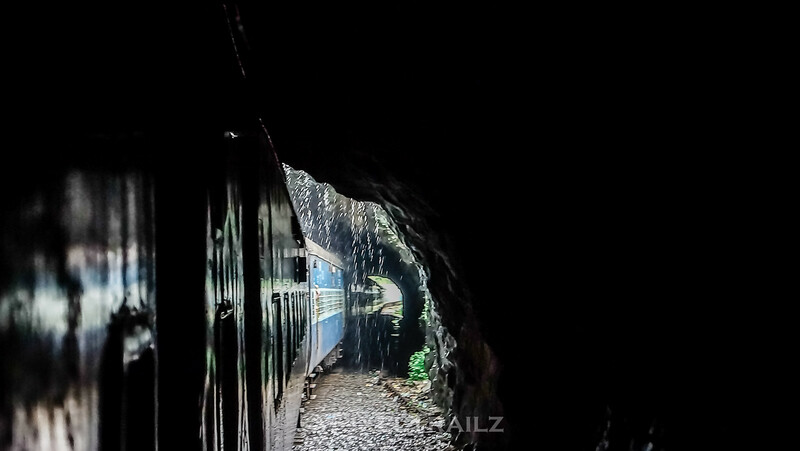 Passing through this viaduct and viewing this from inside the train in peak monsoon is an experience in itself. That little 5 second glimpse gets etched onto your memory like it did in mine. Take the train away from the equation. Take the rhythmic clickety clank sounds out. Take the wind noise out. Take that scream of the tea vendor out. Take your fellow passengers out. In short take everything out and imagine yourself in such a pristine location. Well, reality is indescribable. Imagination has taken a back seat. 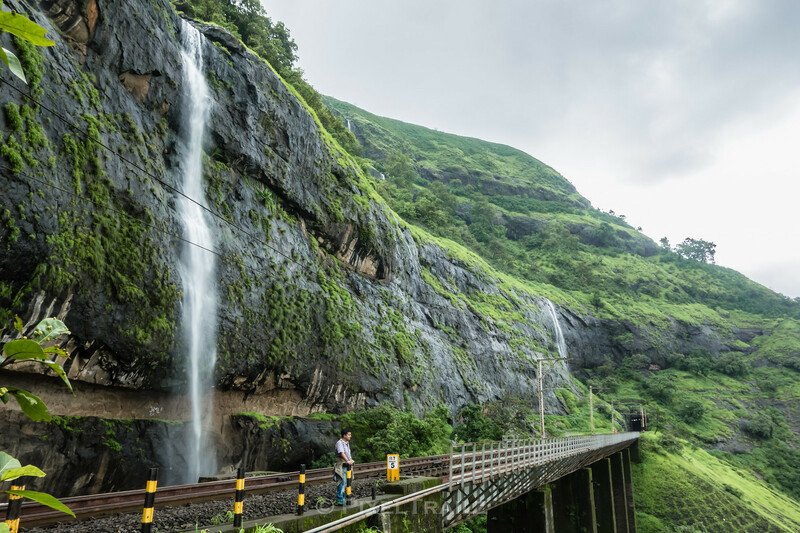 Yes I find myself in the middle of a viaduct with a lovely waterfall on my left, the town of Khopoli down right, a long tunnel to my front and another long one at my back, a deep valley below and a gentle drizzle above. Cool breeze and the refreshing sound of water. All my senses are now awake and at its peak. All the weariness and grogginess due to lack of sleep just evaporated instantly. This sight is worth everything we risked for and will be etched for eternity. As if it was not enough, the lush greenery all around was a delight to a tired pair of eyes. Time came almost to a standstill as we waited for some traffic on the viaduct between the two tunnels. Two hours flew past us in a the blink of an eye. It is time to savor this before I continue any further. April 2015. A hot and dry summer torments the sub-continent. Dehydration and heat strokes batter the citizens. Monsoons are just around the corner and left us all longing for its early arrival. The Southwest monsoons in India usually gets in on time give or take a few days on either side and this year seems to be no exception either. The Met department predicted a scheduled onset of monsoons with normal rainfall. 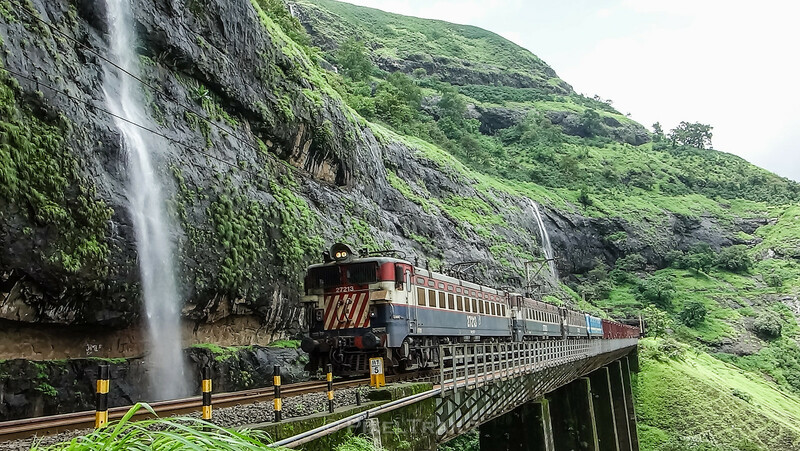 Now that a delayed monsoon and less than normal rainfall is a given, my monsoon rail trip planning needs to start taking shape. A normal SW monsoon leaves the landscapes and the water bodies in its best avatar around the second week of June and now that we have clear picture of the monsoons, it was decided to push it back by a couple of weeks. 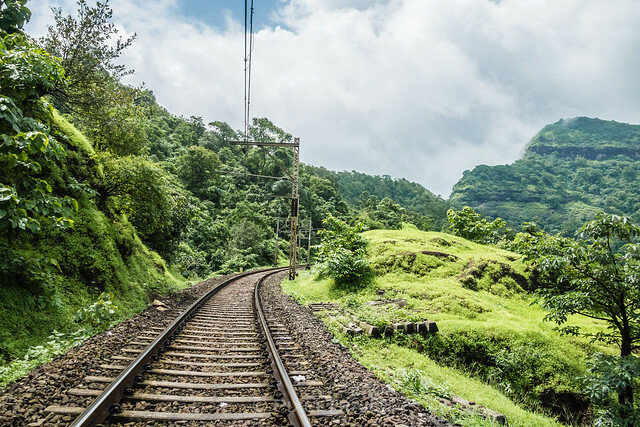 Every year I end up planning on a perfect rail trip in peak monsoons to freshen me up for the rest of the year and just like the Met department, I have a perfect hit rate of going wrong. I was determined to make my planning count this time. 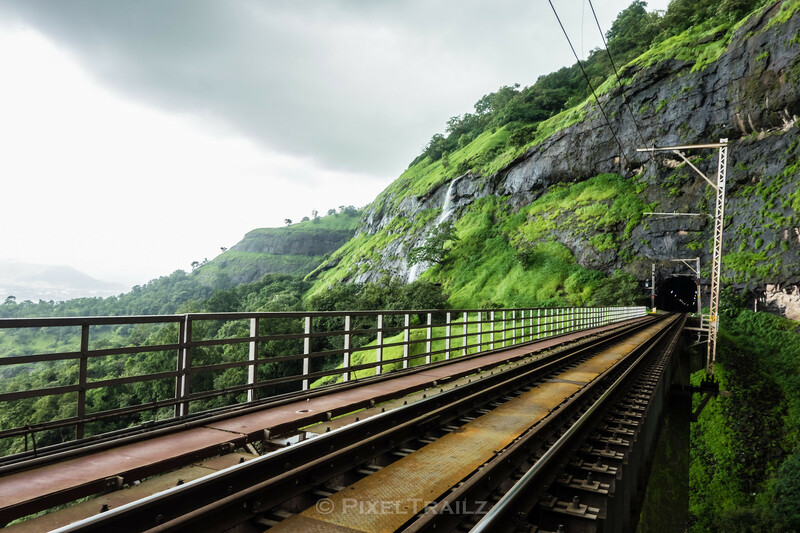 Considering my fellow travelers and my work commitments we decided just to take a couple of days off and planned to start our monsoon rail trip with an air travel. I was supposed to be picked up around 3 in the morning, but due to last minute exigencies, it turned out that I had to book the cab and pick up my companion en route. I book the cab around 2:30 and call up to confirm my hiking partner that I should be picking him up in about 20 minutes. The events that followed should have given me an idea of what is in store. After about 20 missed calls, whatsapp messages, SMSes and trying everything except a pigeon note, I decided not to waste time and assumed he must be asleep at home after finishing his night shift and was zipping towards his residence. Rang the doorbell and stood face to face with his father in law both equally amused and him probably more considering who is this weirdo calling out around 3 in the morning. Before I could explain myself a sharp vibration and a shrill high pitched whine broke the silence and I was relieved to get a call at last from my travel partner. Apparently he had just left office and would be joining me soon. Wee hour traffic of Bangalore and a previous night web check in seemed to be the only saving grace. The pothole ridden roads of Bangalore also ensured that he could take the aerial route at times. After a nerve wrecking ride, he managed to reach home and we departed around 3:45 towards the airport. The adrenaline kept him awake, but I was sure the body would let itself know in due course. Before we knew what happened, we were running towards the boarding gate and incidentally the final two to board the aircraft. A tour operator was taking a large group of pilgrims to Shirdi and had almost,lets say chartered the flight except for a few folks scattered around here and there. The aircraft smelt of fresh curry leaves and the overhead baggage compartment had a small cart load of them. Going green maybe. Nevertheless, we were getting pushed back and waiting for the ATC confirmation to taxi. A group of restless folks suddenly started pestering the stewardesses to open the doors and take the flight back as a few from the group are en route to the aircraft in the airport bus. Needless to say, they were informed that alternate arrangements would be made and when we landed at Pune, we came to know that they were on board another aircraft to Mumbai. There was something very striking here and made me realize life is far more simple than we think it is. A few well dressed tie & suit laden, serious, no nonsense, busy & professional looking started rolling their eyes and came up with all sort of body language reactions indicating their superiority over normal mortals like us and how this bunch of pilgrims needs are so much inferior to them. 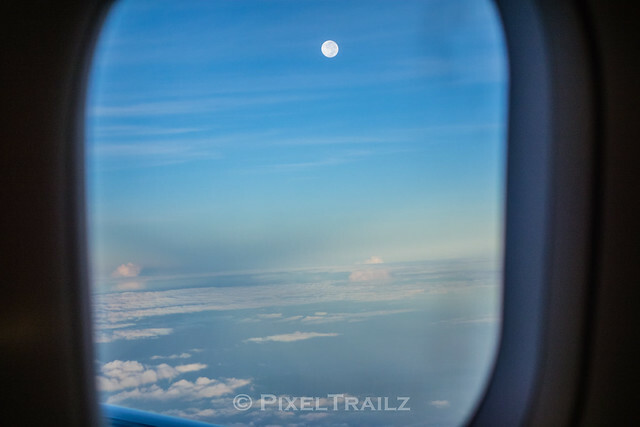 I have to admit I have been in one of those situations as well and my reactions were very similar as well, but as a normal traveler with no business needs associated with this flight, I was actually enjoying it and made me realize that there is a first time for everyone. It made me realize once again that what we are and what we project ourselves to be are way too different. Life is far more enjoyable and non complicated once these two different avatars of you converge as much as possible into one single entity. I made a mental note and decided to make a sincere and conscious effort NOT to look down upon anyone. Not that I do, but whatever little I do should be avoided as well. A human being is a human being and that’s about it. Well philosophy apart, we landed at Pune on dot. Landing at Pune brought me back old film memories. I have always been fascinated by visuals of passengers de-boarding the flight, walk along the tarmac casually and enter the terminal building. As we were just about to land, the head steward made an announcement that since Pune is a defense airport, no photography is allowed once we land and until we are out of the terminal and the events post landing made me wonder on the seriousness of the announcement. We walked down the mobile stairs and walked close to a couple of hundred meters into the terminal building area marked “arrivals”. Needless to say there were a decent number of passengers who were casually walking towards their aircraft to board. I am sure someone was watching all these movements carefully, but the freedom albeit monitored was delightful. 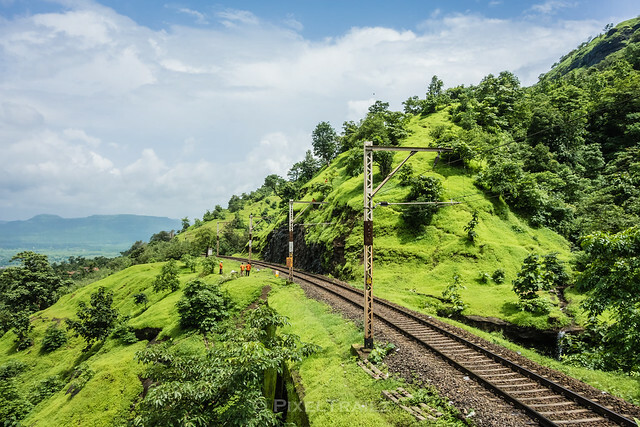 Without wasting any of our time, we gathered our baggage and quickly moved out and Ubered our way to a nondescript hotel close to Pune Railway Station. En route our airport to hotel drive, I called up the King of Shindawane & Bhore Ghats with whom I had multiple discussions prior to leaving for Pune in understanding the dangers and precautions to take before embarking on our adventure. He graciously put us in touch with another IRFCAn who will be banking the ghat section that day to assist, help and guide us. As the day progresses, we will realize the game of hide and seek we would play and when you prepare for the worst, something better than the best would happen. 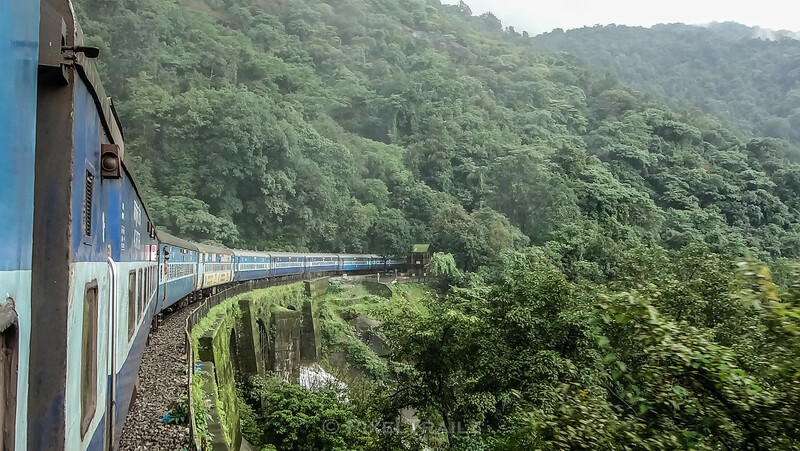 Since our IRFCAn was on duty that morning we had no time to rest and left immediately after freshening up to take the UP 17032 Hyderabad – Mumbai CST express. We got a couple of umbrellas on the way and got 2 general class tickets to Kalyan. 17032 was on time and after a quick chat with the TTE boarded a 3A coach for a short power nap for the day. When we settled with the TTE, we realized that the lady clerk at the counter fooled us with her charming looks and had issued us only one ticket instead of 2, however given our appearance and impeccable dress sense and the fact the honesty and integrity oozed out of our personalities, the TTE decided to give it a pass and wished us good luck when we shared our day’s plans with him. Unfortunately for us, we were unable to meet our lovely guide at Lonavla as he had to take his bankers down for another uphill journey. However he wished us good luck and informed us that we would be put on the Nagnath line (The leftmost of the 3 lines at Khandala towards Karjat). 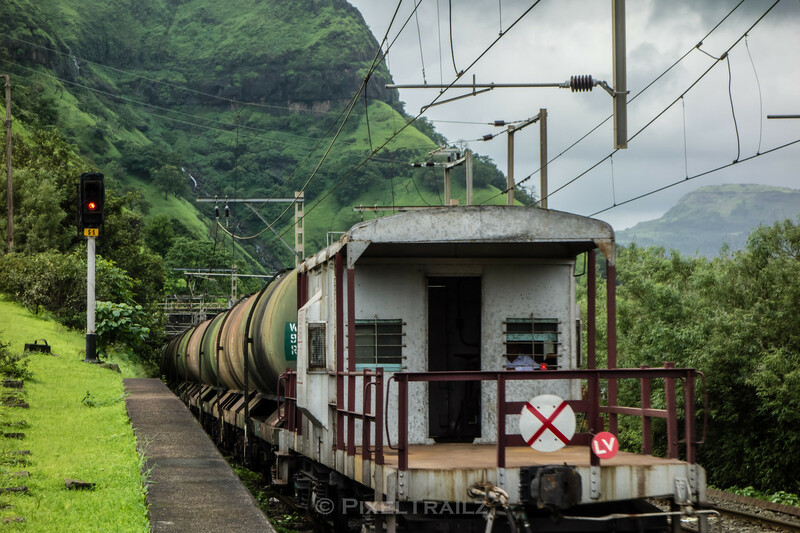 As we departed Khandala, we packed our light bags and took to the doors on either side. We wanted to evaluate the clearance available in the tunnels and how safe it would be for us if we encounter any train while we were inside the tunnel. The dark tunnels and limited visibility did not give us any encouragement, but only increased our heart rate and uncertainty. We went past the Viaduct 6 situated between two long tunnels on the Nagnath line. We reached our first brake testing stop downhill and we got down purely driven by heart and bid our brains goodbye. As the train started moving after the mandatory brake test, I started questioning my brain. Did we do the sensible thing ? Is our heart overruling the brain ? Is this a safe thing to do ? are we risking it ? are we over confident ? have we underestimated this terrain ? Before we could find any answers, the LV board and the big X with blinking tail lights vanished into the mist and light rain. So here we are waiting to explore the beauty of this place. 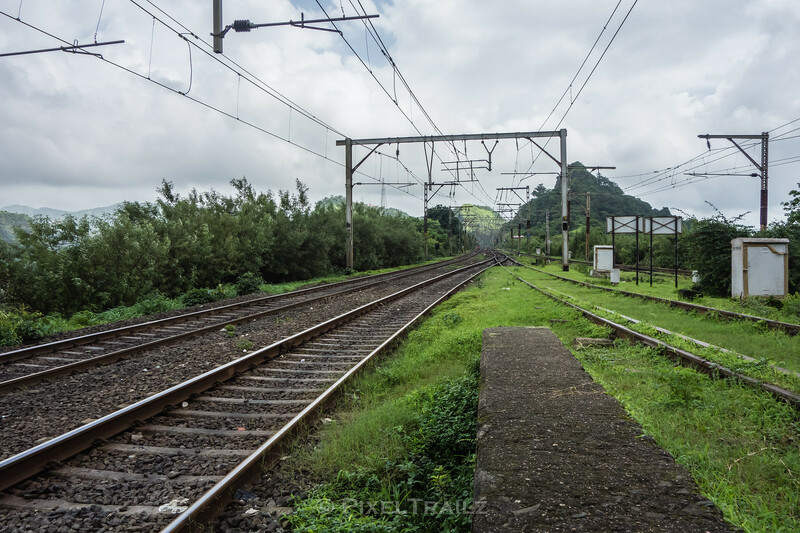 With lots of unanswered questions and half a mind to take the next train to Karjat and not sure of what to explain if we end up questioned by rail authorities, we took an uncertain walk along the tracks towards a small landing for a 2 minute mental break.